Do The Good Guys Win? There’s something inside us that wants to believe that the good guys win in the end, right? We want to believe that if you treat people well, keep your promises, and work hard, that it all pays off with increased opportunity and reward. 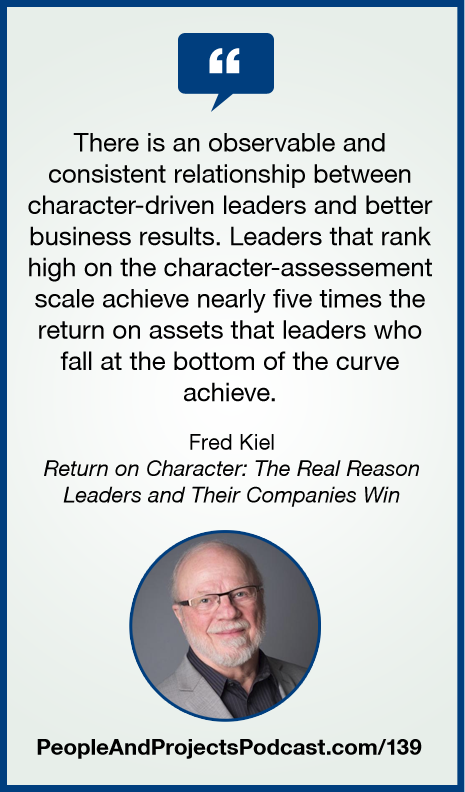 To learn more about Fred and take the Character Predictor Quiz, visit http://www.krw-intl.com/characterquiz/. Join Our Year-End Podcast Listener Hangout! Join other listeners for a Google Hangout session on Thursday, 17 December at 11:30am Central Standard Time (GMT-6). You'll earn a free PDU while we talk about issues related to leading and delivering. Go to http://PeopleAndProjectsPodcast.com/hangout to learn more! In this episode, I mention our Leadership Fast Track Program. I encourage you to check out http://LeadershipFastTrackProgram.com to see if it's a good fit for your development plan in 2016. If so, talk to your boss about getting it in the budget for next year. Let me know if you have any questions about the program. It would be a privilege to work with you directly! WALL STREET available here on Amazon.com. FACEOFF by Kevin Macleod Licensed under Creative Commons: Attribution 3.0 License. CHIPPER DOODLE v2 by Kevin Macleod Licensed under Creative Commons: Attribution 3.0 License.